"Fruit salad recipe Grandma gave me over 24 years ago. Just made it last Easter. It was good." Pour gelatin mix over cottage cheese in a large bowl. 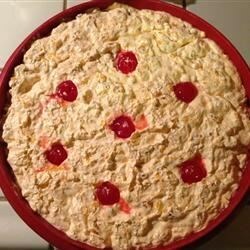 Fold mandarin oranges, crushed pineapple, whipped topping, maraschino cherries, and walnuts into the cottage cheese mixture. I made sure to use 4% cottage cheese since I like the thicker consistency . This recipe is a keeper.